A certified retailer and installer of Sunspace porch windows, Sunspace Twin Cities provides luxury porch windows to homeowners and contractors in Minnesota and Western Wisconsin. Customers can experience a customizable and innovative selection of porch options without sacrificing the “outdoor feel” of a screened-in porch. Sunspace approached Denamico in early 2018 to help them overhaul their website and achieve revenue growth. Committed to inbound marketing, Sunspace Twin Cities wanted to continue to leverage HubSpot for their digital marketing efforts. However, Sunspace has a business to focus on. Their time is best spent having conversations with potential clients, closing sales, and delighting customers rather than working on optimizing their website or creating new content offers and setting up workflows. When it came time for business growth, Sunspace Twin Cities knew they needed an experienced partner with a deep understanding of HubSpot. Sunspace decided to work with Denamico to optimize and automate their sales process, update their website, improve conversion rates, and help them achieve their revenue goals. Years prior to approaching Denamico, and after researching and deciding on HubSpot, Brandon Williamson, the owner of Sunspace Twin Cities, built his own website. However, he soon realized that he didn’t have the time or energy to manage his site and all the moving parts of an inbound marketing strategy. Not wanting to invest in a full team of employees, Brandon decided a marketing agency could help him achieve his goals. Initially, Brandon was working with a less experienced HubSpot agency. However, he continued to have issues with his website and wasn’t getting the results he desired. His initial website had a poor user experience (UX) and led many potential customers astray before converting them to contacts or customers. The previous agency had merged together Brandon’s original site and a new site they created. Merging these two sites resulted in a hodgepodge of design and incongruent user experiences. The effect was almost Frankenstein-like, making it very hard to navigate for both homeowners and contractors. On top of the poor UX and design, the website was not properly optimized for search engines. Eventually, frustration took over. That’s when Sunspace turned to Denamico — an experienced growth agency focusing on HubSpot inbound marketing. To help Sunspace succeed, we knew our solution needed to alleviate their existing pain points. With a major trade show coming up, Denamico had a four-week timeline to improve Sunspace’s website. After an initial audit of their existing website, we determined it would be best to start from scratch. It was a bold decision given the short timeframe, but we knew it was necessary in order to help Sunspace attain their goals. In four weeks, we would plan, design, and develop a completely new website for Sunspace. Denamico delivered a brand new, highly visual, conversion-based website — within four weeks. The website was ready in time for Sunspace’s big trade show, and, as a result, Sunspace was able to direct offline traffic into their inbound-ready website with confidence. What’s more, the new website now reflects the same quality that Sunspace’s products provide. Next, it was time to focus on adding custom functionality to improve lead generation and capture. To do this, we would need to implement additional features such as a quote request form and lead generation offers. At the same time, we continued updating the site to include a more luxurious, high-end feel that aligned with Sunspace’s products. 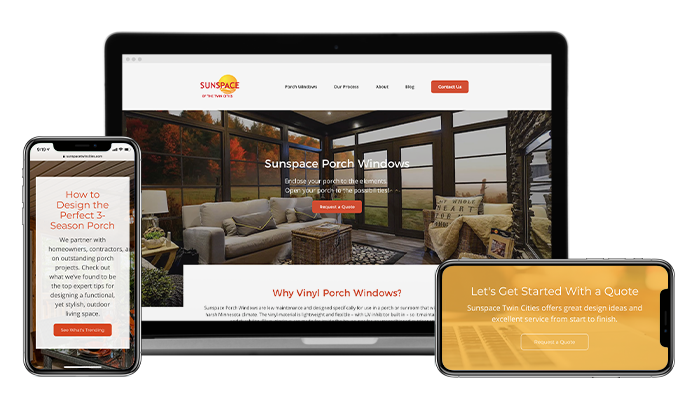 By improving UX and incorporating custom functionality and visually appealing elements that align with Sunspace’s high-end product offering, we helped improve visitor engagement and were able to attract more qualified leads. After improving website engagement, we knew we needed to make some strategic changes to help guide visitors through the site in a more intuitive way. This streamlining of product offerings and segmentation of audiences allowed us to provide more relevant, persona-specific information to both homeowners and contractors. These two groups of customers tend to use different terms while searching for products, have distinct paths to purchase, and different questions along the way. We created two separate webpages to outline the product selection process: one for homeowners and one for contractors. Each respective webpage provides resources and clear next steps for potential customers to request a quote online or to contact Sunspace. By segmenting personas, we were able to move into content creation that directly focuses on each specific audience. During our website build, we decided to update the blog layout in order to better target potential clients. The updated layout includes a sidebar featuring recent posts, post categories, and a blog subscription form. All of these elements work together to make it easier for potential customers to engage with Sunspace. After updating the blog layout, it was time to work on adding video content to Sunspace’s website. To showcase Brandon, also known as “The Porch Guy,” as a thought leader, we used videos of him highlighting the various types of porch windows. We also developed tutorial-style videos as resources for homeowners to reference when making a purchase decision and beyond. Along with adding how-to videos throughout the site, we implemented vlog content to further drive engagement and answer frequently asked questions. Adding this new content to Sunspace’s site has made it easier for potential customers to access relevant and valuable information. Providing qualified leads with helpful content also helps build trust and move them further along the buyer’s journey. Sunspace is now able to identify who their customers are, where they are coming from, and then segment them accordingly. 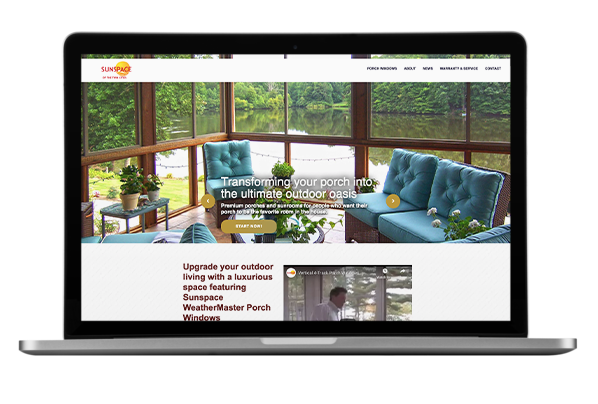 The decision to completely rebuild their website paid off for Sunspace Twin Cities. Now, more than a year later from the initial launch, Sunspace has seen immense growth in traffic, engagement, and conversions on their website. Comparing data between February 2018 and 2019, Sunspace saw an increase of 80% in new contacts as well as a 79% increase in website traffic. These results, combined with ongoing inbound sales and marketing consulting positioned Sunspace to increase revenue. Before: With their old website, Sunspace saw a decrease in sessions from early and mid-2017 to late 2017. In February 2018 there were 550 sessions. 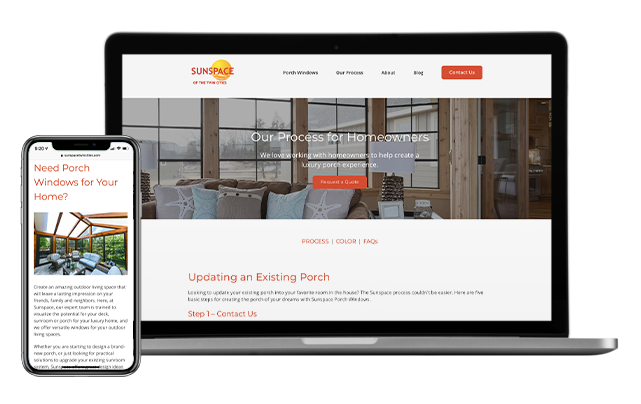 After: Within a year of launching the new site, Sunspace had increased its monthly website sessions by 79%, totaling 986 sessions in February 2019. Before: 345 new monthly visitors in February 2018 via their old website. After: 693 monthly visitors in February 2019 via their new website — an increase of 101% from the previous year. Before: The old website generated 78 new contacts from February 2017 to February 2018. After: The new website generated 200 new contacts from February 2018 to February 2019 — a 194% increase in new contacts and potential customers. Since the site launched, a year's worth of analytics have shown us that Sunspace Twin Cities’ contacts have grown significantly, providing many more opportunities for revenue growth. 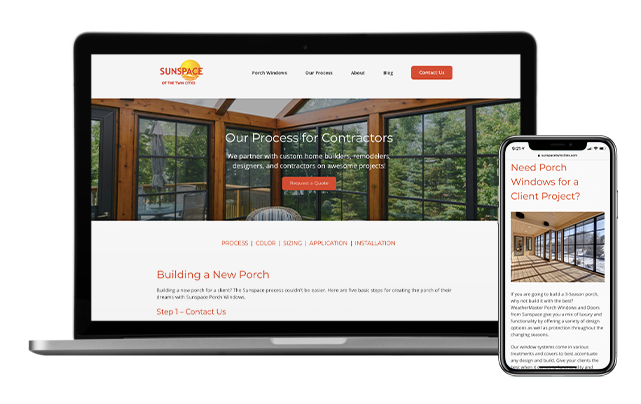 Beyond an increase in website traffic, from 2017 to 2018, Sunspace Twin Cities signed more project contracts and increased their revenue. This was the case in the span of February 2017 to February 2018. During this time, the total number of projects increased by 37.5%, and the average revenue per project also increased. As a result, Sunspace saw their revenue increase by 40%. Sunspace’s revenue numbers have continued to grow well into this year, and we’re eager to help them achieve additional growth throughout 2019 and beyond. As Sunspace Twin Cities gears up for their busy season, they’ll be focusing on one of their key sources of revenue: trade shows and events. At Denamico, we’ll be focusing on helping Sunspace continue to grow their business through inbound marketing. 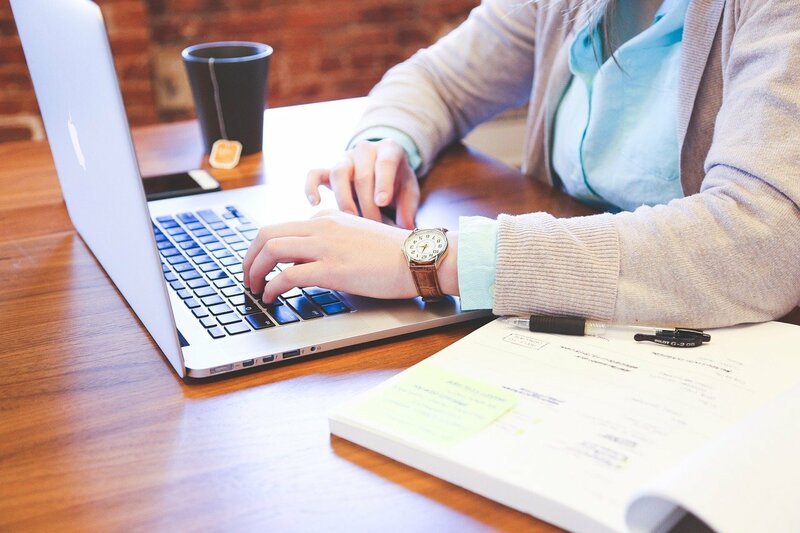 By employing advanced strategies and best practices, we’ll ensure Sunspace has qualified leads coming into their pipeline from multiple sources. 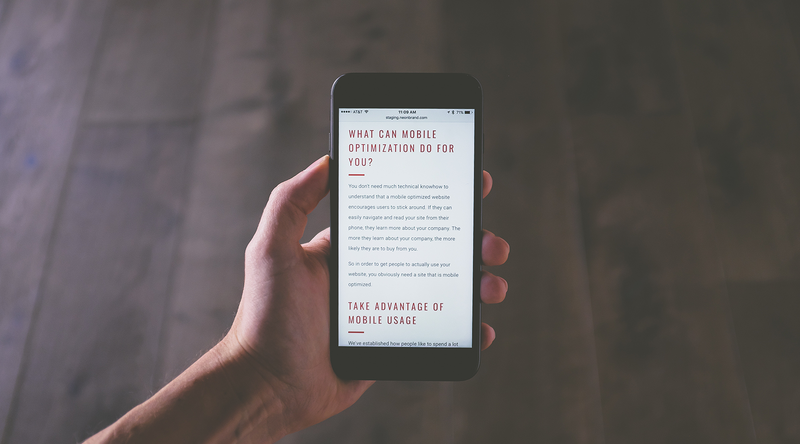 We’ll spend the remainder of Q1 and Q2 working to improve on-page and off-page SEO to boost Sunspace’s organic search rankings. At the same time, we’ll continue our content marketing efforts, including video production, to increase engagement and drive conversions. Brandon at Sunspace Twin Cities has always appreciated that Denamico is proactive and strategic. By not sacrificing Sunspace’s long-term goals for the fact that we had a short timeline, we were able to maximize results. By helping them achieve profitable revenue growth from February 2018 to February 2019, Sunspace Twin Cities is now able to be more selective about the projects they take on. As a result, their per-project revenue is higher and they are better able to maximize profitability. Through the implementation of HubSpot and inbound marketing strategies and best practices, we’ve helped countless businesses like Sunspace improve their revenue year over year and reach their growth goals.